One thing you can say about established brands: They hide a multitude of sins. The iPhone, darling of the media and the masses, is assembled by thousands of Chinese paid a fraction of the hourly rate for a McDonald’s flipper. Regardless of designer label—Calvin, Donna, or Ralph—you can trace the provenance of that cherished shirt or jeans to a backwater in Eritrea or Malaysia, where women earn pennies by the production lot. And the Volkswagen Beetle, the epitome of sixties counterculture and all that is hippiedom, came courtesy of one Adolf Hitler, who wanted a vehicle that could do for Germany what Henry Ford’s Model-T achieved for America (alas, the Fuhrer didn’t dream up the bud vase that has been part of most Beetle models). 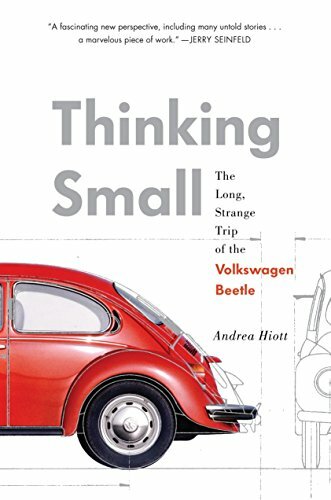 Andrea Hiott’s history of the Bug, Thinking Small: The Long, Strange Trip of the Volkswagen Beetle, could just as easily be titled Capitalism Is Funny That Way. At its best, the story of the Volkswagen captures the dichotomies of human endeavor: We start out with the best of intentions even as the means to reach cherished goals slowly litter our lives with broken china and hearts. So it is with the Beetle, which started as the pet project of a dictator who unleashed the Holocaust, was nearly destroyed, and then became an object representing new economic and social potential—the freedom of human mobility in a country once run by the Nazis. Clearly, Ms. Hiott subscribes to the Great Man Theory of history. She centers Thinking Small around three of them besides Hitler: Ferdinand Porsche, the Volkswagen’s designer and one of the giants of automotive lore; Heinrich Nordoff, the practical, reserved executive who lifted the company from the ashes, turning its hometown, Wolfsburg, into Germany’s Detroit; and Bill Bernbach, the Jewish advertising genius who in 1959 created a media campaign for the Beetle that still remains one of the most memorable ever seen then or now. What’s amazing—even with the company’s devastation in World War II—is that each of the author’s protagonists achieves the goals he set out for the Volkswagen. Only one percent of Germans owned cars in 1933, but Hitler’s enthusiastic embrace of the autobahn and Porsche’s “people’s wagon” provided his nation the arteries and objects of transport. For Nordoff, a promising Opel executive who after the war was consigned as a garage manager until recruited by British officers then running Volkswagen, it was fulfilling the vision that Porsche—imprisoned by the French after Germany’s defeat—set down but hadn’t yet achieved for lack of an efficient factory. Bernbach, whose family disowned him for marrying an Italian Catholic, not only challenged Detroit’s Big 3 by representing Volkswagen but also flouted many of his industry’s conventions, including using large swaths of white space in the car’s ad displays and simple, informative language in the copy. Thinking Small was written with an eye toward the launch of the Beetle’s latest redesign, but the reader should be prepared for a long narrative march. Ms. Hiott, who is editor-in-chief of the cultural journal Pulse, has taken a social scientist’s approach, the result being a tendency to over-contextualize. Thus, we get long historical windups before embarking on a scene as well as meanderings off the reservation—for example, Bob Dylan as a basis for understanding Hitler. Ms. Hiott also veers a bit toward hyperventilation in her passages about Bernbach and his agency. One might have hoped for slightly cooler prose and a tighter through-line with the help of her editors. Her subject deserves such care, for the Beetle is an elegant machine that embodies simplicity at its most sublime. Given birth by a madman, yet nurtured by valiant, caring stewards such as Nordoff and Bernbach, the Volkswagen Beetle is truly an industrial miracle. There is no reason it should have survived the Third Reich, but it did—transforming into a global icon, the phoenix of an industrial age.